← Who booms and who busts when drilling expands along the Beartooth front? The oil and gas boom has been underway for a number of years in many locations across the country, and there are now a lot of stories about individuals and families whose lives have been personally affected. This post is part of a regular series of those stories on this blog to help you envision what could happen if drilling expands along the Beartooth Front. Look for these once a week. Today’s story comes from the most recent issue of the Missoula Independent. It’s written by Kelly Conde, who originally developed the story as part of her master’s thesis in Journalism, Natural Resources and Environmental Science at Montana State Bozeman. This is an excerpt of a much longer story on how 40 square miles of aquifer in northeastern Montana — “more than enough to provide each person in Montana with adequate drinking water for life” — was contaminated years ago because the oil company dumped millions of gallons of wastewater into unlined impoundments. The water gradually seeped into the aquifer and ruined it. Even though this method of disposal is discredited and no longer used, there were themes in the the story that are very familiar. Murphy Oil Company, which has grown over the years into an international corporation, stood before the Montana Board of Oil and Gas Conservation, and told them that the 42,000 gallons of wastewater they were dumping into the ground daily “was not hurting anyone.” The Board of Oil and Gas didn’t blink, and authorized the continuation of the practice. Even though this is no longer current practice, the blithe assurances from the oil and gas companies that there’s no problem with what they’re doing, despite evidence to the contrary, and the complicit willingness of the Board of Oil and Gas to rubber stamp whatever comes their way is a familiar story. Nobody was looking after the public interest then, and it’s hard to see that much has changed. One of the constant themes on this blog has been the “unknown unknowns” about this process, and the need to slow down and determine the long-term impacts of what we do before we do it. Today’s personal story is an excerpt from the Conde’s thesis. I recommend reading the whole story, which looks at the contamination and its effects from many different perspectives. You can read the whole story online at the Missoula Independent, or download Conde’s master’s thesis. It started with rust. In the toilet. On the shower stall. Helen Ricker saw the orange stains and wondered what was causing them. Her water came from a well, from an aquifer that had always been good. So she drank the water anyway. Beneath the ground, the diluted edges of a large groundwater contamination were seeping by in a slow, gravity-fed progression. Little by little, Ricker’s water got worse. The water stained her white sheets when she washed them and turned her white socks orange. Every time she filled the sink to do dishes, the water’s surface shimmered with an iridescent sheen. Residual grease covered her plates long after soap washed away the night’s meal. Then the water started to stink. A sulfurous stench rose from the toilet in the bathroom and cascaded out of her faucets. Ricker stopped drinking her water. Ricker lives on the Fort Peck Indian Reservation three miles north of the town of Poplar, on the desolate BIA Road 75. Her home lies two miles southwest of the East Poplar oilfields, a large expanse crisscrossed with rutted dirt roads and spotted with blue, yellow and black oil pumps bobbing up and down like plastic drinking birds from a novelty store. The oilfield is not as productive as it used to be. But that soon may change. The Fort Peck Indian Reservation is on the western edge of the Williston Basin. Beneath the reservation and expanding east into North Dakota is the shale-rich Bakken formation. In the past, the oil and gas in this particular rock was untappable. But recent advances in oil and gas drilling technology have provided a way to break the Bakken’s grasp on what is now known as the largest continuous deposit of natural gas and oil in the U.S. The once humble farming town of Williston, N.D., which is at the center of the Bakken reservoir, is now bursting at the seams with oil workers from all over the U.S. Though Poplar is only 97 miles west of Williston, things are still very quiet there. Hotels have vacancies, and restaurants have empty tables. But many believe that a new oil boom is on its way. Fort Peck experienced its first oil and gas boom in the 1950s. Then, like now in Williston, men and huge machines descended upon the rolling land north of Poplar. Oil wells speckled the area. The East Poplar oilfield was tapped first, and regulated later. On the outskirts of Poplar, groups of thin-walled houses popped up—shantytowns nicknamed after their parent oil company. Today, the skeleton of “Murphyville” remains as one of many reminders of the boom. A more jarring reminder, however, is below the surface. The oil rush of the 1950s led to thick plumes of contaminated groundwater. Fifty years later, the era still haunts people like Ricker who have been living on bottled water for the past three decades. 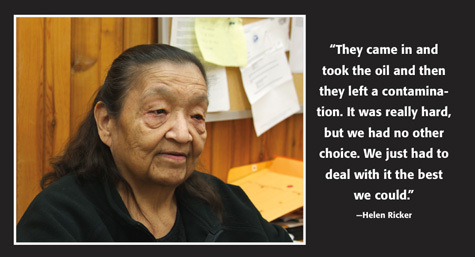 So while many on the reservation prepare for a new oil boom, Ricker and her neighbors are still living with the consequences of the last one. Ricker, 72, lives with her husband, George, in a house perched above the meandering Poplar River. The view from their house is one of overwhelming sky and rolling hills cut by deep ravines. In the distance are the profiles of numerous oil wells. Ricker has dark shoulder-length hair streaked lightly with gray. When relaxed, her face sags under the weight of the years, of raising her children and grandchildren, of losing one son to cancer, of surviving breast cancer herself. But then she smiles and time and tension slip away. Ricker is three-quarters Sioux and an enrolled member of the affiliated Fort Peck tribes. She grew up in the vast country off Road 75, on land held in trust by the federal government for the Sioux and Assiniboine people. Her current residence is only a quarter mile away from her childhood home. A lot has changed since she was young. As a child, Ricker filled buckets with well water from the single pump in her yard to wash clothes or do dishes. Ask anyone who lived in or around Poplar at the time and they will say the same thing: the water off Road 75 had a special quality. It was cold, clean and sweet. That is rare in northeastern Montana. Spend some time in this open, lonely land and know that rivers and streams run slow and muddy. Aquifers are shallow. The water from the tap tastes of too many minerals and not enough time out of the sun. But the quality of the water off Road 75 was enough to lure people from Poplar and beyond to several bubbling springs or to the well of a family or friend. When Ricker and her husband moved back to the country in 1971 after a time in Poplar, the water was still good. But less than two years later, it began to change. The oilfields had been around for 20 years at that point, and their presence was beginning to show. The cool, clear water of Ricker’s childhood turned the color of urine. Its sweet taste was replaced with a strong chemical flavor. Ricker reported all of this first to the tribe and then to the Indian Health Service with no reaction. So she learned to deal with her water. She and her family hauled drinking water from town. She learned that Dawn dish soap worked best for cutting through the oily film left on her dishes. She stopped buying white clothing, towels or bedding. When her granddaughter was a toddler and started reacting to the water, Ricker hauled water for bathing as well. This way of life became the norm. Ricker and her family were resigned to it. It took nearly 20 years after Ricker first saw the rust in her bathroom before anyone decided to do more than just deal with the water. This entry was posted in Personal stories and tagged Bakken, Helen Ricker, Kelly Conde, Missoula Independent, Montana Board of Oil and Gas Conservation, personal stories, Poplar Montana, water contamination. Bookmark the permalink.